Norelco has just the answer for you with their Philips Norcelo AT810 Electric Razor. It comes with the company’s Dual-Precision blades for the cleanest and closest shave, yet responds nicely to the different contours of your face with its Dynamic Flex Heads. Versatile and convenient to boot, it supports corded or cordless operation, and is flexible enough to use wet or dry. The rotary shaver is also integrated with some of the brand’s innovative features, such as a Pop-Up Trimmer, No-Slip Grip design, and the acclaimed Skin Glide and Aquatec technologies. To seal the deal, there are even a couple of freebies included in the set, such a cleaning brush and protective blade cap. The AT810 Powertouch comes with the same shaving precision expected from Philips Norelco. It has a patented dual-blade design that not only cuts unwanted hair, but raises them for a perfectly close shave. This feature also ensures that long hair and short stubble are comfortably cut, while the flex heads provide dynamic contour response to your face and neck areas. Now you don’t just get a closer and cleaner shave, but a faster one at that. For added versatility, Philips Norelco integrated the AT810 Powertouch with their exclusive Aquatec technology that completely protects the device against sweat, oil, and moisture. This will let you use the electric shaver in and out the shower confidently – with no risk of breakage. No matter if you like to shave dry for convenience, or prefer to groom with foams and gels for extra skin protection, you can do so anytime, anywhere. Thanks to a cordless design, the AT810 electric rotary shaver is easier to use than ever. 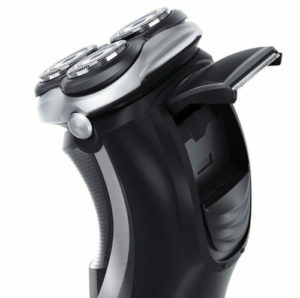 It’s powered with a Li-Ion battery pack that provides up to 50 minutes of shaving time (with a full 1-hour charge). Alternatively, a quick 3-minute charge can give it enough juice for one cordless shave. The included cord on the other hand, means that it allows a corded operation whenever it’s needed. There’s also a LED Charge indicator, along with a Low-Battery and Battery Full Indicator to keep you updated of the battery status. This eliminates the guesswork on when to charge and when to pull the plug. Apart from these features, the electric rotary shaver comes with a number of other tricks up its sleeve. For one, there’s an integrated pop-up trimmer that gives it the ability to trim mustache and sideburns with ease. The aptly-named SkinGlide feature is also present to minimize friction and irritation every time you shave. Plus, an anti-slip grip design will let you maintain a secure grasp and prevent those accidental cuts and drops. The AT810 is also known as the Shaver 4100 and comes complete with a cleaning brush, protection cap, and power cord. It measures 2.2 by 2.2 5.8 inches (D x W x H) and weighs in at approximately 9 ounces. Philips Norelco has the electric rotary shaver covered with a 2-year limited warranty.